Click on a question below to find the answer you are looking for. If you still have some questions, Feel Free to Contact Us . 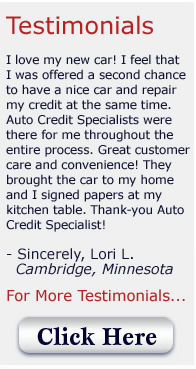 Auto Credit Specialists has access to vehicles through auctions and dealers. Most of these vehicles are lease or rental returns and can be seen on this website under "Find the Car You Want". We get you pre-qualified for a loan and match the loan with the vehicle(s) that interest you and quote you numbers. Once we have found a vehicle that meets your needs and budget, we arrange delivery of the vehicle to you. There will be loan requirements that you will need to provide at delivery. What loan requirements may be needed? A recent paystub, copies of driver's licenses, a utility bill, personal references, proof of insurance, landlord's name and phone number, title for your trade-in if trading, and any down payment. Yes, as long as they can get us back from the delivery. Will I have to pay a penalty if I refinance early? NO. The main objective here is to get you a reliable vehicle at an affordable payment and show you how to improve your credit standing so that you can qualify for better financing in the near future. What types of vehicles do you sell? We sell late model vehicles with low miles because this is what the lenders typically want to finance. They want to finance reliable vehicles so that you just need to concentrate on normal maintenance and on making your payments. Many of the vehicles will have the balance of the factory warranty remaining. If the factory warranty is expired the vehicles will be covered for 30 to 60 days or 1,000 to 2,500 miles depending on the current mileage. Extended warranties are available provided the lender is willing to finance them. How do I get the vehicle registered? We take care of that for you. We include tax, title, and licensing fees in the loan and mail the money and paperwork to the DMV and they mail you your plates and title. You will receive a temporary permit that will cover you prior to your plates coming.